One of the greatest gifts to mankind is coffee. This is just my opinion, but I’m sure there’s a person or two out there who would agree with me. How you drink your coffee also matters. 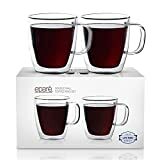 That is why we are going to review the best glass coffee mugs. Granted, there are a lot of different types of coffee mugs in the market. But how many of them can offer the same visual appeal? The size of the mug: We all have drunk different amounts of coffee. It is important that you first gauge your intake before you buy a mug. If you prefer drinking a lot of coffee, you should get a large sized mug. The opposite applies if your intake is less. Get the mug that will satisfy your needs. Price: The price of the coffee mug is also important to consider. You will either be buying the coffee mugs for personal or commercial usage. In a formal and commercial setting, it is important that you consider the number of mugs that you can get as well. The more quality mugs you can get the better. 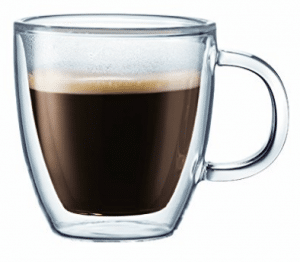 Handle or no handle: Some glass coffee mugs don’t have handles. They make it easier to even walk around with. If the coffee mugs are for commercial and formal settings, it is advisable that you buy ones which have handles on them. 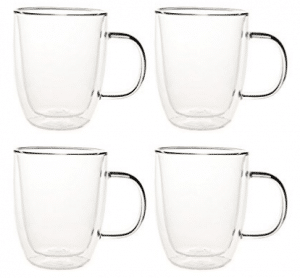 These glass coffee mugs come in a set of 4. They are double walled and make for a modern yet vintage look. In fact, they give off a European-style feel wherever they are placed. Whenever you have a party or gathering, you will be proud to show them off. 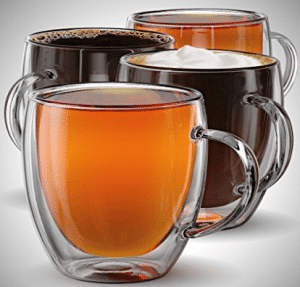 These glass coffee mugs are what every household needs! What I liked about them was how durable they are. These glass coffee mugs are not even prone to getting scratches. As investments, they surely are worth the money. The mugs have a temperature range of about -4 degrees Fahrenheit to 302 degrees Fahrenheit. You won’t worry about any quick temperature changes to your drink. The glass coffee mugs have handles. Each of the mugs has a 16oz carrying capacity. For trendy coffee mug options, these ones are the way to go. They are re-usable and can be used with several other drinks. Getting this thermo glassware set is one of the smartest decisions you could make. 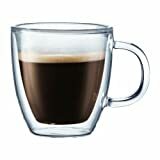 You will be getting a black and blue Bodum Bistro double wall glasses. 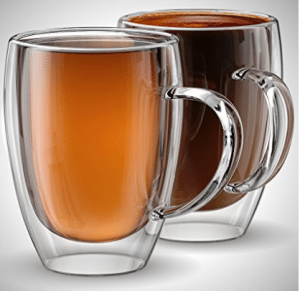 These glass coffee mugs are coated with silicon and are non-porous. You can travel with them easily, thanks to their anti-splash silicon lid. You won’t have to worry about your drink getting spilled over. Don’t let the fact that they lack handles worry you. You don’t risk getting burnt as you use them. Your hands will be protected with the thermal silicone sleeve around the glass. 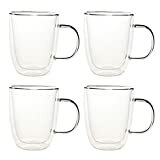 The glass coffee mugs can be used in the microwave. The mugs can be used as kitchen aids. Every kitchen needs items which can be easily cleaned. 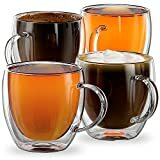 That is why these Libbey Robusta glass coffee mugs are popular. You can place them in the dishwasher and not have to worry. When you purchase them you will also get tips on how to protect and handle them. If you are expecting a large number of guests, they are an ideal choice. Your desserts will look tastier than ever! The best part about the mugs is that they will still come in handy during brunch. Whatever time of day is or type of occasion, having this glass set will not let you down. The glass coffee mugs are lead-free. The mugs are 13-ounces each. I would recommend these glasses, for individuals who are very particular with their coffee. They have been designed in a manner that, no condensation would take place at the lip of the glass. Some people tend to argue that, the water ruins the coffee’s taste when it slips inside the mug. Your grip will not be affected and will remain firm as well. These glasses have been made of reinforced borosilicate glass. As a result, they are resistant to thermal shock and do not absorb odors, residue or chemicals. You will get yourself a set of two very sleek glasses. The glass coffee mugs can be dish-washed. You will also be able to use them in the microwave. These glass coffee mugs are handmade. They are double-walled and have insulation capabilities. 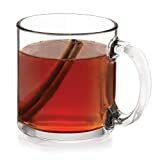 Your hot drink will keep warmer as you drink it, while your cold drink will keep you cool as well. Durability is one of their strong suits as they are made for daily usage. Their design is European-inspired and will make your drink look as if it is suspended in the air. Your purchase will come with a 100% money-back guarantee. Each of the glasses measures 250ml. 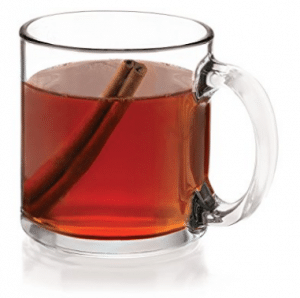 Anchor & Mill Homewares brings you other mugs which a 9.4-ounce capacity. They are perfect for a variety of drinks. Some examples include macchiato, tea, juice, iced beverages, smoothies, cappuccino, latte, and espressos. Regardless of the temperature of your drink, you won’t have a hard time handling the glass. They have been designed in a way that they remain comfortable to touch. Each of the glasses is inspected by hand before being sold. 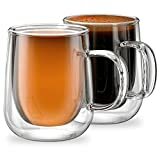 The glass coffee mugs come in a set of two. 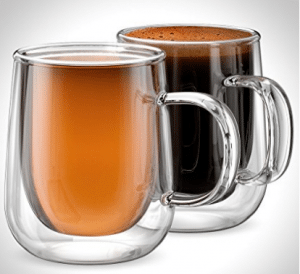 These particular glass coffee mugs are 12 ounces in size. They have the largest capacity among the company’s glasses on this list. You can expect to get a quality performance from these mugs. They have no residue retention and their insulation capabilities are outstanding. Purchasing these handmade borosilicate-glasses will leave you adding more sets of the same. The glasses have a European inspired design. They have a high-end look. If you are looking for heat-resistant glasses, Bodum has the perfect ones for you. 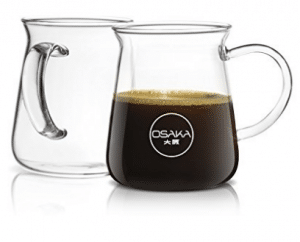 The mug is mouth-blown and has been made with borosilicate-glass of lab quality. You will be impressed when they are the only glasses left standing in your kitchen. The mugs are also winners of the prestigious, European iF Design Award. You will get a 1-year limited warranty. It has a sleek 2 layer design. 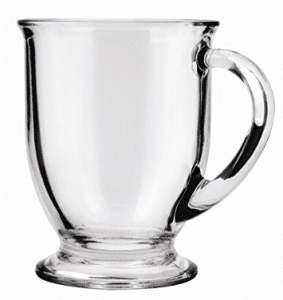 Anchor Hocking has the best glass coffee mugs for commercial usage. They are designed with a footed base to prevent any spillage. For easier handling, they also have thick handles. They are recommended as a healthy option. Reason being, they won’t leach chemicals into drinks. I also like the fact that the glasses do not discolor. 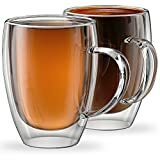 The glass mugs are 16 ounce in size. 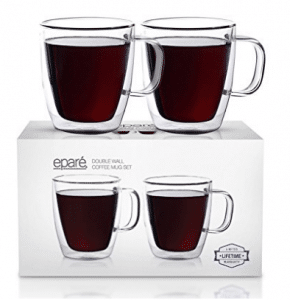 Eparé glass coffee mugs are thinner and lighter in nature. However, they will surprise you with how strong they are. The glasses are made resistant to breaking; they can even withstand thermal shock and scratches. If you have clumsy kids, you will feel more at ease with them. The fact that they are double-walled is also a bonus. You will get a limited lifetime warranty. The glasses are even freezer safe. 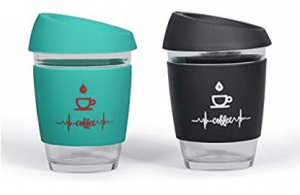 Our choice of best glass coffee mugs is the Eparé Insulated Coffee Cups. They have so many outstanding features to them. Being constructed from high-quality chemistry grade borosilicate plays a big role in their performance. The glasses also create a dramatic optical illusion which is visually enticing. 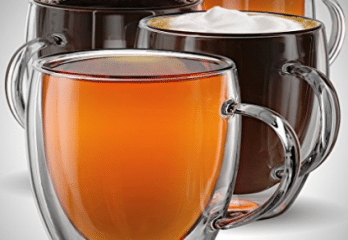 Be sure to add one of these glass coffee mugs to your cart.